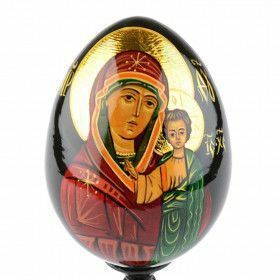 Russia has a long and rich religious history, as shown through our assorted collection of products regarding faith, and observance. 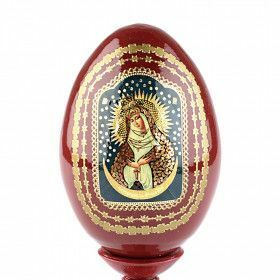 Whether it's a Russian Orthodox icon, or an Orthodox nesting doll, we know that you will find something to love in our collection. 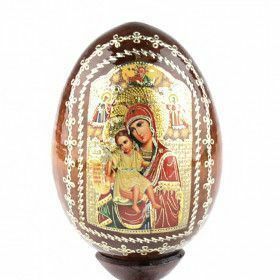 Browse our other religious items, such as Icon eggs and gold crucifix cross pendants. 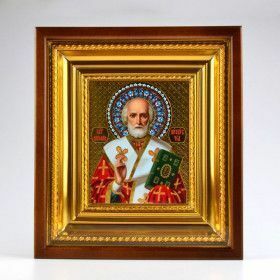 If you ever have a chance to talk to a devoted Russian Orthodox about faith issues you will see how highly venerated the icons are. 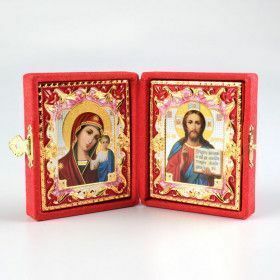 The legend of the very first icon "not made by human hands" refers us to Christ himself and his lifetime which dates more than two thousand years. The story tells us about Christ's final trip to Jerusalem where crucifixion would take place. King of Edessa having been sick at that time sent for the Savior. Christ could not come in person. Instead he sent the king a piece of linen cloth that he had dried his face with. The king got healed when he received that cloth, and people of Edessa kept it carefully and started making copies of that first facial impression of the Savior. 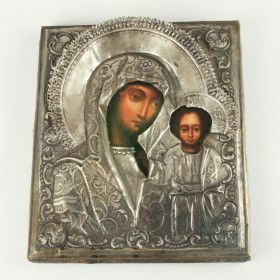 The Orthodox tradition names Apostle Luke as the very first iconographer who painted the Holy Theotokos (Mary, Mother of Christ) and two icons of Apostles Peter and Paul. 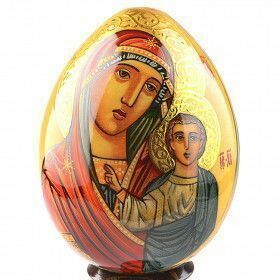 Icons are sacred religious images. From the early days of Christianity, they have been used as an aid for prayer and meditation. 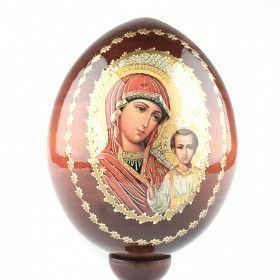 Typically, they are the portraits of Christ, Mary and the Saints and can also be the visual representations of biblical scenes or historical events in the life of the church. 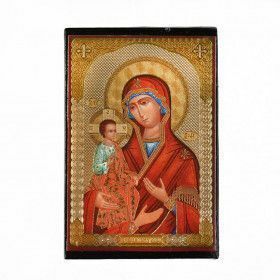 Being more than art, the icons are perceived by the believers as windows into heaven, "theology in imagery, the icon expresses through color what the Gospel proclaims in words" (Michel Quenot). 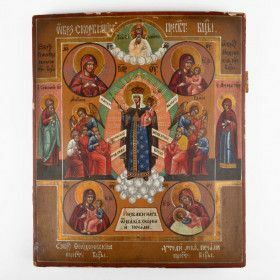 This explains why icons are often referred to as being written rather than painted. 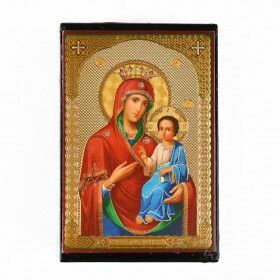 The colors of the icons are symbolic indeed. 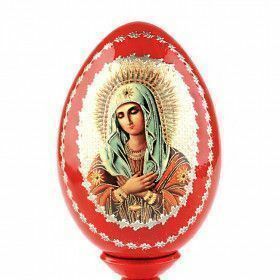 White means purity and innocence, gold conveys God's glory and splendor, green is the color of new life and fertility, red is the symbol of Christ's blood and also beauty, purple depicts power and authority. 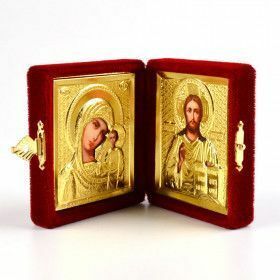 Since icons are not quite the works of art but the earthly reminders of heavenly realms, the rules of creating an icon are very strict and have been kept vigorous through the centuries. The iconographer prepares himself through the period of prayer and fasting to become a servant of God. He is not to sign an icon, not to use his imagination in the process and thus not to expect any recognition. 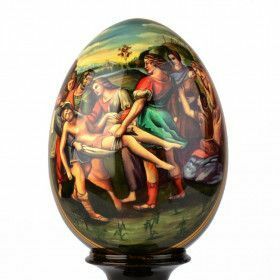 His purpose is to follow the rules of iconography where everything is predetermined: two-dimensional imagery, facial expressions with no emotions shown, no shadows, no time, color symbolism. 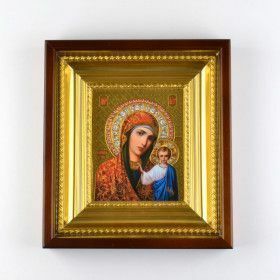 Commonly the icons are small images made on wood with the paint (egg tempera), but it is also possible to see icons made of copper, mosaic, embroidery, carving, or weaving. 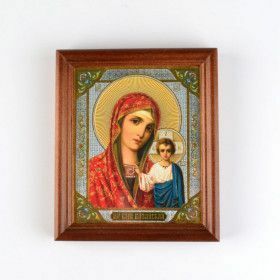 As a rule, a religious Russian home would have icons hanging on the wall in a so-called "krasny ugol" (red or beautiful corner). The cross, the symbol of victory over death and intersection of the heavenly and the earthly, is the central symbol of Christianity. 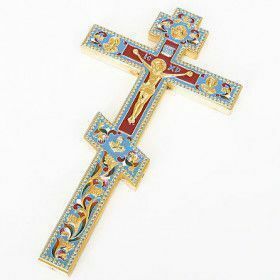 Russian Orthodox cross (or Suppedaneum cross) is distinctive of having three horizontal crossbeams. The top one frequently has a sign INBI on it which is a Greek acronym of the phrase "Jesus of Nazareth, King of the Jews" the inscription made on a plate and put over the head of the Crucified Christ. The bottom crossbeam represents a footrest pointing up towards Heaven on Christ 's left side and down, towards Hell on His right side. The lower crossbeam sometimes can be straight rather than slanted. There are variations of the shapes and symbolism of the Cross. Calvary or Graded is one of the common ones. It sits on a base of three steps which sometimes are interpreted as Faith, Hope, and Love, or represent the slopes of the Calvary Hill. Adam's skull and bones are depicted under the hill. The letters NIKA are the abbreviated Greek words for the phrase "Jesus Christ the Victor, the Conqueror". 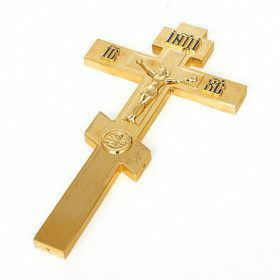 The Cross initially having been the instrument of cruel Roman execution and having been transformed by Christ’s victory over sin and death later is often decorated with precious or semiprecious stones.